Authorized Baldor Repair Center. Get Your Baldor Motor Repair here, Now! RepairZone is an authorized Baldor AC Servo Motor repair center. We have quick access to Baldor factory parts to aid us in our lightning fast repair and turn around. We can help with your entire Baldor servo system. You can also order new Baldor servo motors, drives and more as RepairZone is an authorized distributor as well. Our factory trained technicians test each component to make sure your repair is completed to your complete satisfaction. Your Baldor servo motor is run-tested on a Baldor test system and carries a 1 year warranty. 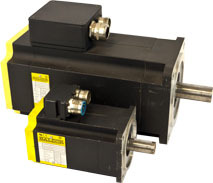 Or, browse our Baldor Servo Motors for repair, exchange, or purchase.